A bit of fellow designer love here, Bre from Rowanmade is a huge inspiration for me. She is an incredible designer but also writes beautifully both in her blog and her newsletter in which she promises ‘Just Me, being honest, with you’ and that is exactly what you get. Bre isn’t scared to give you the good and the bad that comes with running a design business and shares her past experiences for you to learn from. Don’t expect sleazy sales pitches, just beautiful words and experiences. Jen is the lifestyle business coach of dreams but she doesn’t stop there. Her content is some of the best I have ever read and is shared to your inbox through her fortnightly Sunday letters. If you have ever read one of Jen’s blog posts, you will know that she pours her heart into writing meaningful and helpful posts which will help your business and find your meaning in whatever you do. The letters are completely unique each week and give you a little boost to start a new week. Brand strategist Devan is an expert when it comes to everything branding. In her weekly Brand Love Letters, she offers top notch advice which can help you build a strong brand which serves a purpose. She does not hold back when it comes to great advice and even offers some amazing strategies you can implement. Wonderfully written by Lola Hoad, the creative behind One Girl Band a group for female creatives and entrepreneurs, the OGB Weekly Letters always give amazing advice and tips for those who can sometimes feel alone in the big world of business. I always get excited when I see one of these drop into my inbox and I can guarantee that it will leave me thoughtful. Not to mention, each letter ends with a Weekly Affirmation which always makes me feel better about any situation. When you join the Inner Circle of Sales Page Designer and Strategist Liz from Linea Mae, expect interesting and informative content perfect for a creative business owner. Liz doesn’t shy away from lesser talked about subjects and really gets into the big problems we face as business owners. Plus, you get first dibs on her strategy sessions and coffee chats, something which I’m desperate to get involved with soon! Sara Tasker is the blogger and Instagram expert behind Me and Orla and provides the best knowledge about Instagram, a tricky platform to get right. As well as her incredible blog posts, Sara sends out monthly newsletters featuring new and wonderful hashtags to explore and experiment with. They are mostly under 1k which gives you are great opportunity to try something new whilst it’s still getting going. 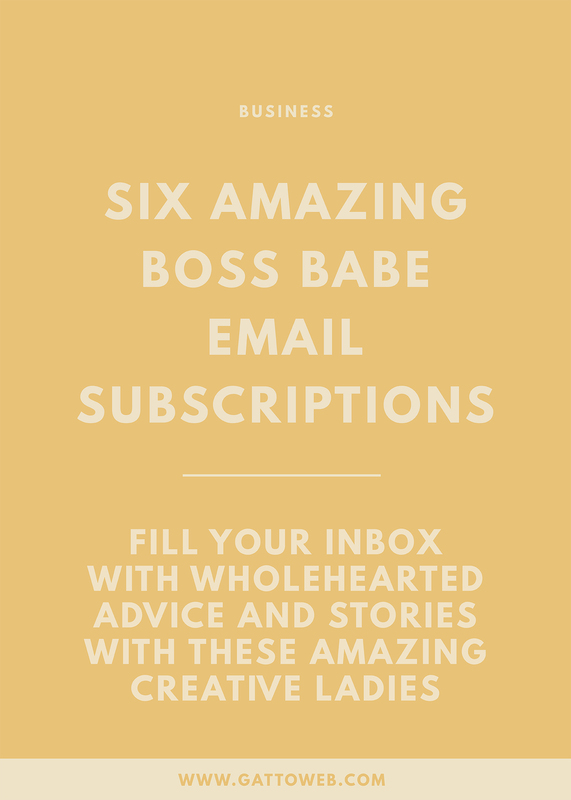 Tell me your favourite email subscriptions - I’m sure I could spare a little space! Cheeky self-promo, you can sign up for my newsletter below in which you will get a newsletter every other week filled with advice, stories and even a few offers here and there. You also get access to my free creative resources library which is added to regularly!